Of course, for the Arctic Cooling Accelero Hybrid, the proof is in the testing. Once I was satisfied that I hadn't bricked the GeForce GTX 680 during assembly, I went about testing it in eVGA's OC Scanner X software. I've actually been pretty happy with OC Scanner X in personal use, and it generates enough heat to give the coolers a good workout. I will say that what I found in testing, while not necessarily unexpected, was still pretty impressive. Ambient temperature during testing was ~21C. 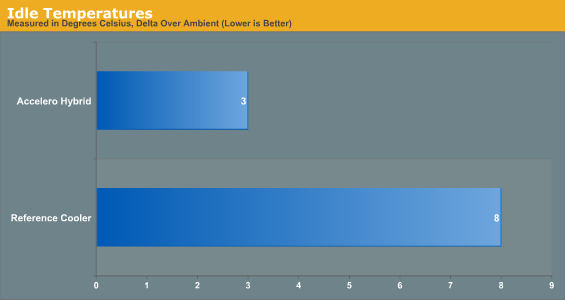 Unsurprisingly, idle temperatures are pretty impressively low for both cooling systems, but already the Accelero Hybrid is able to produce a substantially better result well outside of the margin of error. Once a load is applied to the card, though, all bets are off. 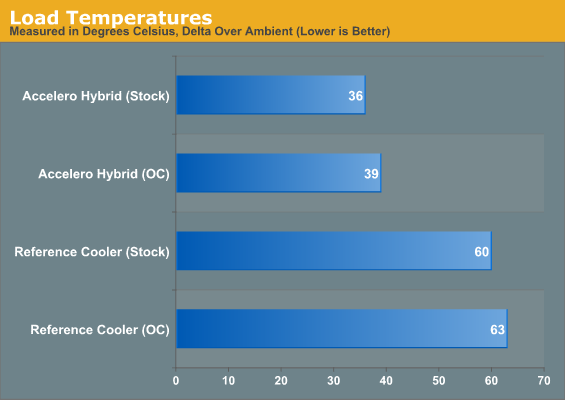 The Accelero Hybrid blows past the reference cooler, producing a massive reduction in thermals. Keep this in mind, I'm going to come back to it later. 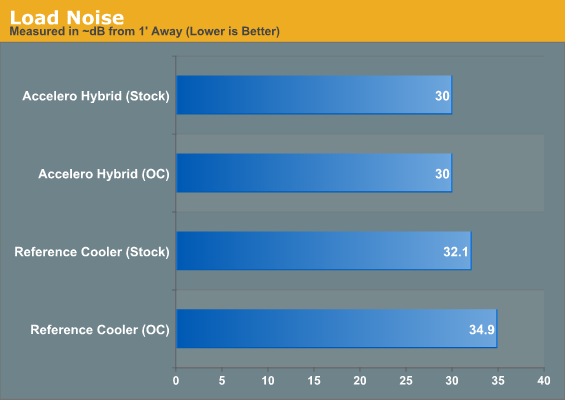 Since the reference cooler and Accelero Hybrid both idle below the 30dB floor of our sound meter, idle noise results aren't listed. What's impressive is that the Hybrid is almost dead silent under load, regardless of the increased pressure applied to the cooling system. So while the reference cooler gets louder the harder you push the card, the Hybrid seems to have plenty of thermal headroom to spare. Using the Arctic Cooling Accelero Hybrid on the GTX 680 has also revealed another interesting wrinkle. While overclocking on the GTX 680 is mostly limited by the Power Target, the reference cooler definitely introduces some thermal limitations. I've seen the GPU clock of the 680 take a step back and begin to throttle a little once it goes north of 70C, but because the Accelero Hybrid has so much thermal headroom, that throttling almost never happens. With the fan control manually maxed out at 85%, I registered a noise level of just 31.3dB in testing, but have actually been able to push the 680 north of 1.3GHz. The stable 6.6GHz clock on the GDDR5 has been consistent between the reference cooler and the Hybrid, but the added headroom for the GPU has allowed me to move past the ~1.2GHz I was able to attain on the stock cooling. As I've been writing this review, I've actually been steadily testing overclocking on the GTX 680 plus Hybrid by incrementing the GPU Offset +10MHz, running it through OC Scanner X for fifteen minutes (and accepting no artifacts), then benchmarking it in 3DMark 11's Extreme test. This is by no means a thorough stability test, but it's a decent way to poke around the edges of the card's tolerances. I can't imagine how much hotter and louder it would be running with the reference cooler, but with the Hybrid at 85% it's peaking at 63C. That's at 1.3GHz, sustained load. I've seen this cooler being tested before on the HD7970, though I don't remember which site it was but they posted an almost equal result to what you just did. I remember that the temps were very low and noise is almost no concern either because it's so low even when they compared it to the MSI Twin Frozr card (I think it was the 7970 lightning). This review just backup their claim. An interesting remark since the arctic cooling site lists this as being compatible with the 78xx series and NOT with the 79xx series. Unless people have a real space limitation, I strongly recommend against using liquid cooling systems for a CPU/GPU unless your intent is to be a hobbyist playing with these cooling systems, which is pretty much impossible with a CLC. If that's the plan then buy a real H2O based open loop cooling system which can deliver better cooling than a highend HSF. They start at $175. and go up. They can be entertaining for a hobbyist even if not a good value. Test after tests has shown that CLCs do not cool as well as a highend HSF, they cost more than a highend HSF and they are noisier than a highend HSF. The worst problem however with CLCs is that they not only can leak and cause expensive PC hardware damage, lost data, RMA's, etc. the fact is they DO leak and cause the aforementioned problems. See the Corsair H2O web forums for real tales of horror. It's wise to educate yourself before getting duped into using an inferior CLC cooling system for your PC. If you still want to jump into the water, go right ahead, it's your dime, your time and your arse when the CLC leaks, is noisy or does a poor job of cooling. You've been warned so you have no excused for being duped by misleading CLC hype. Technically challenged folks who fail to do their homework often perceive CLCs to be superior because they use water to transport the heat to a radiator. Unfortunately CLCs are not superior in any way other than a smaller footprint if your PC case will not allow a quality highend HSF. If that's the situation you'd be smarter to buy a larger PC case, not a CLC.